Just when you thought we’d be more socially aware and sensitive by now, you’re wrong. Sa SERVICE ELEVATOR ang sakayan ng mga nabanggit. That’s House Rule 11.6 for you. 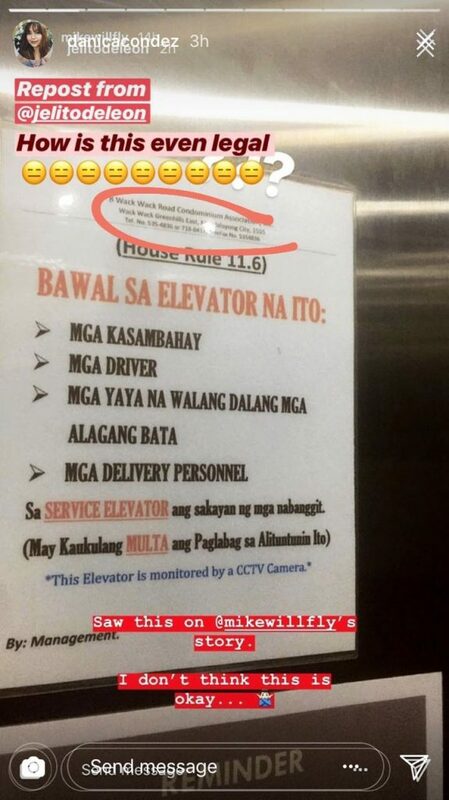 We saw this discriminatory guideline from visual artist and blogger Mike Miguel’s Instagram Story when he used the lift of 8 Wack Wack Road Condominium. And we’re sure 8 Wack Wack’s not the only condo guilty of this; this is just an example of what the majority of condo managements do. This is actually reminiscent of the same issue that transpired four years ago. Icons Residences drew flak after making the same policy in its condominium. The issue blew up, Kris Aquino and Boy Abunda even slammed the management’s rule (and the property manager herself) on their primetime entertainment news program. The Catholic Bishops Conference of the Philippines expressed its dismay, too. I would like to echo Nadine Lustre’s logic about this one. “Come on, guys. It’s .” Property managers should’ve learned from Icons, the sacrificial lamb. We should be shunning elitism and discrimination, not elevating it.